Chocolate sandwich cookies and reduced-fat cream cheese come together to make an appetizing combination. Sprinkle in white chocolate chips for that extra burst of flavor. Close your eyes for this bite of ecstasy — it takes only three ingredients. Make ahead of time and enjoy this rich and satisfying treat! 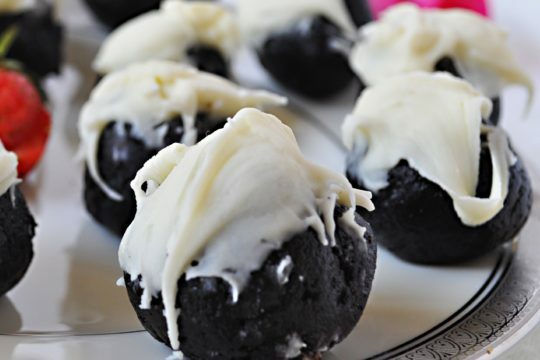 In food processor, combine chocolate sandwich cookies and cream cheese, pulsing until mixture forms a ball. Shape mixture into 1-inch balls and place on baking sheet lined with wax paper. Refrigerate 1 hour. In microwave-safe dish, microwave white chocolate chips for one minute, remove and stir until melted and creamy. Dip top of each ball in white chocolate and return to wax paper. Refrigerate until white chocolate hardens. Makes 4 1/2 dozen truffles. Baker’s Tip: Once truffles are hardened, you can transfer to resealable plastic bag. Keep refrigerated.